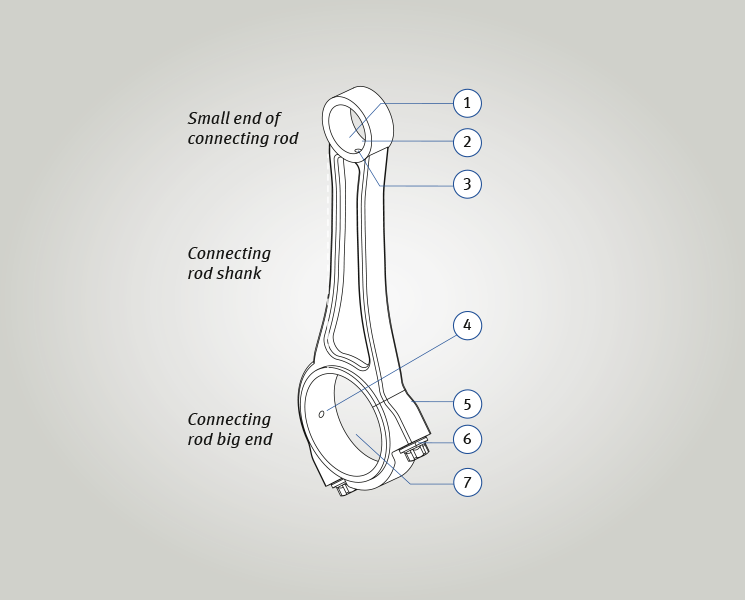 Connecting rods form the link between the crankshaft and the pistons and transfer the gas and inertial forces to the crankpins on the crankshaft. The connecting rod pushes and pulls the piston into and out of the cylinder. The small connecting rod eye on the piston side serves as a mounting for the piston bolt and is frequently equipped with a bronze connecting rod bearing bush. The connecting rods are mounted with connecting rod bearing shells on the crankshaft pins on the crankshaft. The large connecting rod eye is split to allow mounting on the crankshaft. To provide lubrication to the piston pins, connecting rods are frequently fitted with a drilled oil channel. Connecting rods are forged or cast from steel. 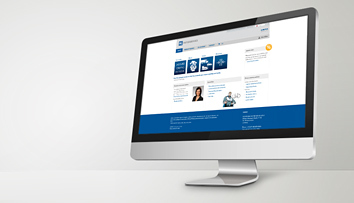 Depending on the intended strain, alloyed or hardened and tempered steel may be used. Connecting rods must be replaced if they become fractured or bent or if the bearing holder on the rod has been damaged. 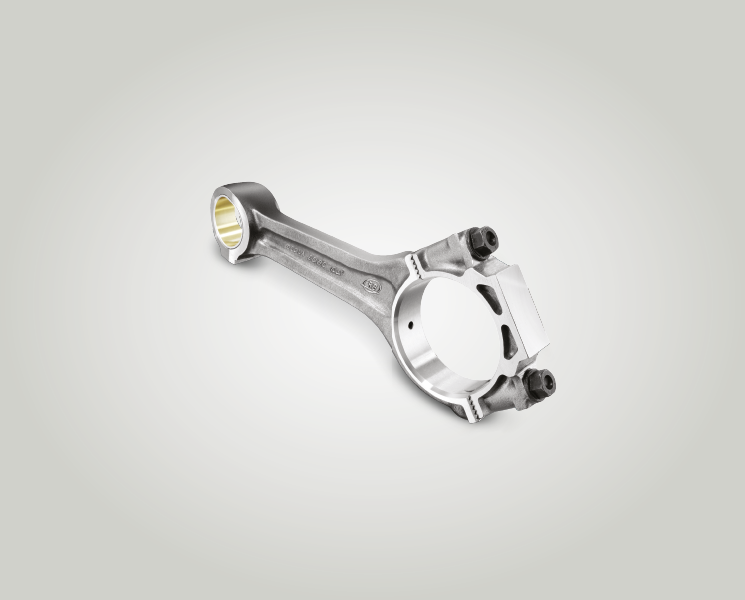 Provided that the other connecting rods are not damaged, the connecting rods in utility vehicle engines can be replaced individually. The small connecting rod eye and the conrod bush are described as the small end of connecting rod. The piston is connected to the small end of connecting rod via the piston pin. The connecting rod shank connects the small end of the connecting rod to the big end of the connecting rod. 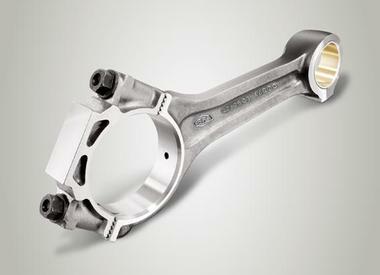 The connecting rod shank normally has a double T cross section. Many connecting rods feature an oil channel through which additional pressure oil is supplied to the small connecting rod eye. The big end of connecting rod describes the lower part of the connecting rod that surrounds the conrod journals of the crankshaft. can be smooth, toothed or cracked. The bearing cap on the big end of the connecting rod is attached using two connecting rod bolts. For very large crankpins, connecting rods may be separated at an angle. This is necessary to allow the connecting rod to slide into the cylinder, in spite of the large connecting rod eye. 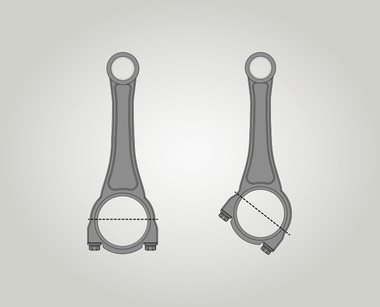 When using connecting rods with angled separation, the installation position must be observed, especially in in-line engines. 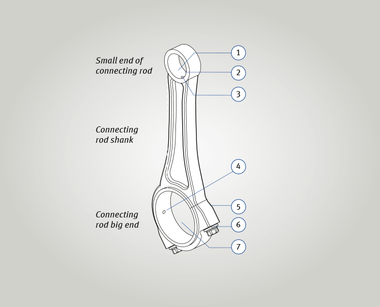 Cracked connecting rods are initially produced as a single unit, then given break lines (sinter rods) or laser notches (steel connecting rods) and split (cracking) into two parts. 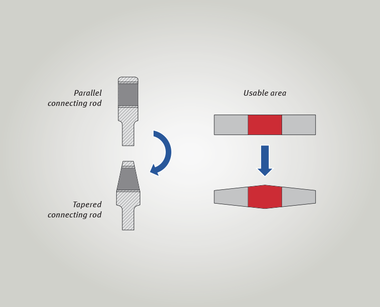 Both parts are screwed together when the connecting rods are assembled, with the point of fracture ensuring that the rods fit together precisely. 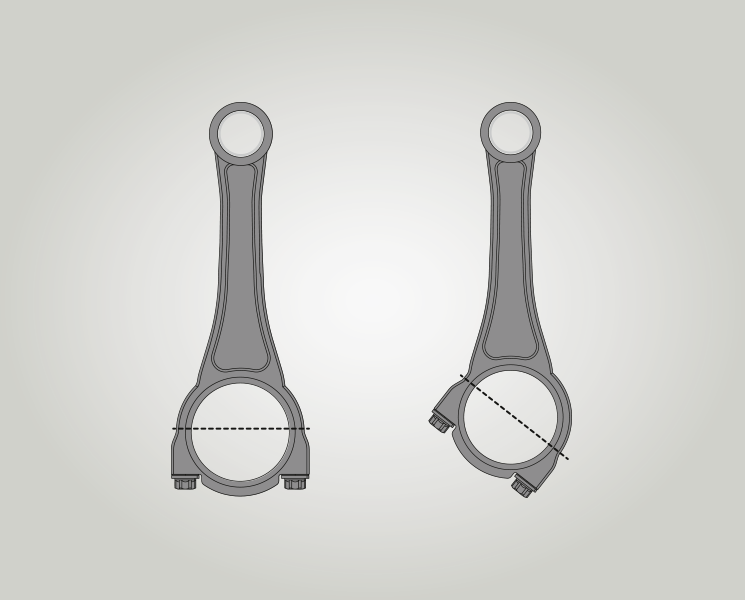 Connecting rods and connecting rod caps must always be used together on account of their breakage geometry, they cannot be interchanged. 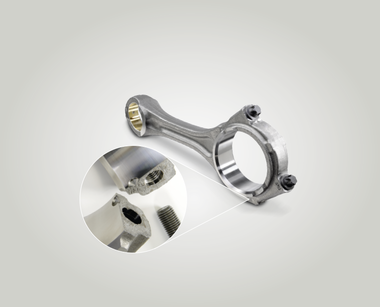 Cracked connecting rods offer more advantages in terms of strength, cost and production accuracy. Once assembled, the joint faces are barely visible. Connecting rods and connecting rod caps fit together very precisely, thus allowing maximum force transmission. is then fixed with locating bolts or pins. increased by using tapered connecting rods.